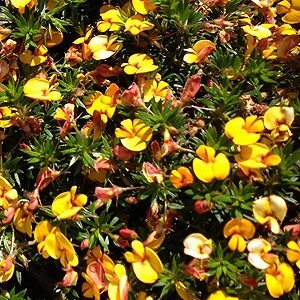 A wonderful ground cover plant Pultenaea pedunculata is an Australian Native plant that is commonly called the matted pea bush. Masses of flowers from spring continuing through summer this is a tough little plant in the right conditions. Best suited in an open position in full sun to part shade, this is a frost tolerant and requires little care once established. Reaching a height of around .2m over time this lovely little ground cover will spread to around 1m. 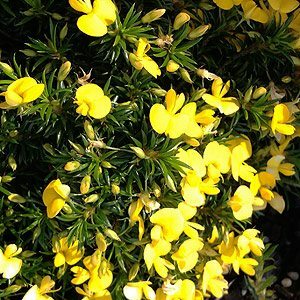 Excellent in a rock garden or near the edge of a retaining wall where it will trail over the edge a little. useful for attracting bees and butterflies. Two forms are commonly available Pultenaea pedunculata with golden yellow flowers (pictured above) and a variety with yellow to orange flowers as well (see below). A well drained position in a fertile soil, sun to part shade is best. Water during the first summer, after this it should only require water during very dry periods. A slow release Native plant fertilizer (low phosphorous) applied in late winter is beneficial. Spread – 1.5 to 2m.